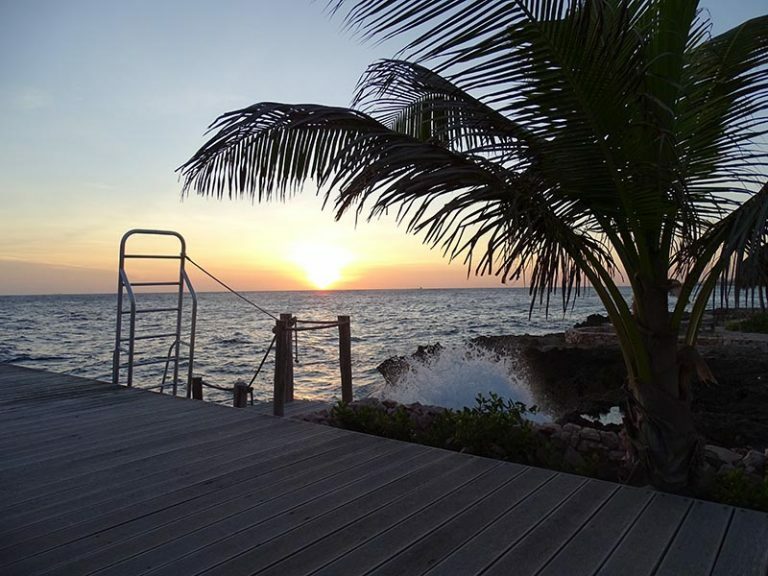 Why book with us, Villa Sea Paradise Curacao in the Caribbean? Curacao is a Dutch island in the Caribbean, which makes it special. It is also known as one of the ABC islands: Aruba, Bonaire and Curacao. Next year they will belong for 385 years to Holland. It is not only known for its cultural historic monuments but also for its: floating bridge, beaches, floating market, natural port and famous liqueur Blue Curacao. Curacao ‘s population is a mixture of Dutch, African and South American descendants. Curacao loves to dance on the best dance music such as: merengue, bachata, salsa, reggae and hip-hop. Food on Curacao varies from Dutch (haring, bitter balls), several American food chains (Larry’s, KFC, Burger King, Mc Donnalds, Pizzahut), Brazilian steaks, Dominican aroz moru, Venezuelan arepitas, Japanese sushi, Chinese noodles and fried rice and Curacao red snapper. You name it we have it all. Curacao has no hurricanes, snakes, alligators, sharks, forest fire, volcano eruptions nor flooding. We have lots of sun shine and sea. Your vacation is guaranteed to be a success on this island. Curacao is located outside the hurricane belt. Booking your vacation with destination Curacao you can rest assured that you wouldn’t run any risk due to hurricanes. The villa is located in a gated community in Boca Gentil resort with 24/7surveillance. 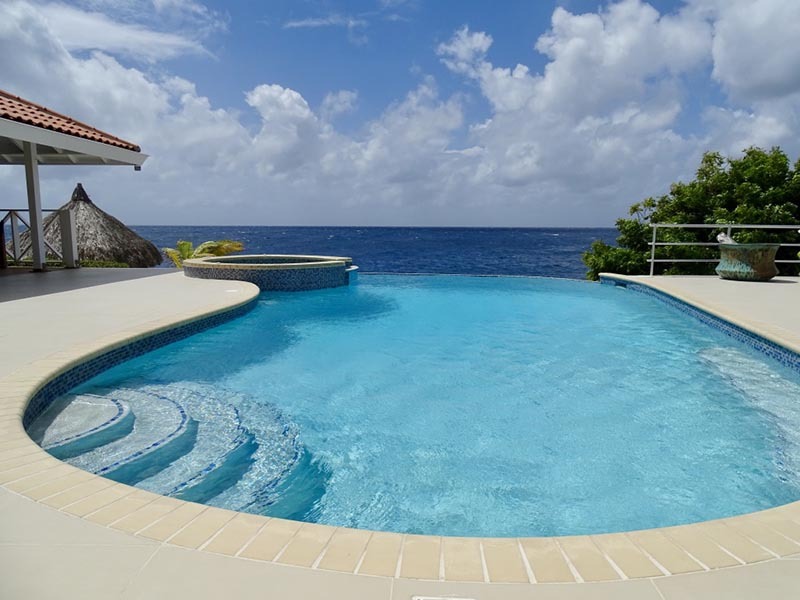 Our beautiful vacation rental right on the shore is named Villa Sea Paradise Curacao and is on the East/South end of Curacao. It is a nice 4 bedrooms Oceanfront villa with private pool and Jacuzzi. You can dive or snorkel right there in your backyard! We have direct access to the crystal blue Caribbean Sea. For an impression of the villa, its surroundings and reviews, visit our website https://www.villaseaparadisecuracao.com. We have a lot of amenities in the neighborhood such as grocery (Van den Tweel) restaurants (Zest, Tinto), scuba schools, Spa, Gym facility, ATM machines, Diamond Casino, rental cars facility and some bikini shops. One can also rent all kind of gears for sea fun activities such as: snorkels, masks, fins, kayak, Jet sky/ Sea-doo, under water scooters, banana ride you name it! Vacation home Villa sea Paradise it’s the only rental I manage, so I am able to keep it nice and make it a special place for my guests to enjoy their vacation. During your stay, I am available by phone, text, or email if any issues arise or if you have any questions about Curacao. Around the villa you can hike to the saltpan, a lagoon that could be open to let seawater in with the tide and then the salt water evaporates to leave a deposit of salt. This was a big business for the island back then when salt was worth more than gold. There is also a fortress near the Caracas bay called Fortress Beekenburg built in 1703. It was from there that the English lead by Commodore Murray tried to overtake the island but was pushed back into the sea from the adjacent hill called Kabrietenberg. There our national hero Pedro Luis Brion gained his fame as a strategic captain and later became admiral in the Venezuelan independence struggle against Spain under leadership of Simon Bolivar. As a millionaire Pedro Luis Brion donated all his fortune for that cause. Close by there is also the sunken Tugboat a favorite place for divers and snorkelers with lots of corals and sea fishes. There is also a beach there called the Governors bay. Want to hire a sailboat, catamaran or yachts there is plenty places where you can do so. Most are located in and around Spanish water and Barbara beach. They will take you to open sea for fishing, snorkeling or diving adventure. They will even offer BBQ on a remote private beach with all included. Restaurants in the neighborhood are Zest, Tinto, Suchi bar Kyoto, Zanzibar, Fuego and several restaurants near the roundabout at Caracas bay. The 3 restaurants we recommend and prefer are El Gaucho with its fabulous view of the surroundings, L’ Aldea placed within a jungle theme, serving all you can eat Brazilian BBQ meat and Fort Nassau, dining in a historical setting with an amazing view. Andrew Jones – played for several teams but gain fame with Atlanta Braves breaking Mickey Mantle’s record. A record he still holds as the youngest player ever to hit a home run during a World Series. Christmas and New Years Eve are the two top happenings on Curaçao. Lots of people are changing their dreaming of “white” Christmas into a “sunny” Christmas! They join us on Curacao in saying “Happy New Year” in a sunny weather on Curacao! Willemstad and the floating bridge are then beautifully decorated for Christmas and New Year. Whole neighborhoods on the island participate together in the competition to bring their home area into the best Christmas atmosphere possible using decorative lights. Boca Gentil attracts every year several famous soccer players and artists to spend their Christmas and New Year at the resort. In Boca Gentil Resort they celebrate New Year’s Eve twice on that same evening! Champagne is raised at the midnight Dutch time (6 hours ahead of Curacao) and also at midnight during the Curacao count down. So book your Christmas holiday with us to experience these one of a kind events. The Christmas markets are: Christmas Fair Jan Thiel (next door), Christmas Market Country House Assencion, Christmas Fair Pietermaai, Christmas Fest Food Vegan, Hello Skalo Christmas Village. You definitely need a car to travel around and get to these places. The villa is located in the Jan Thiel district. Everything is located within 20 minutes drive. Nightlife in the area of the villa is at Jan Thiel Beach. For nightlife elsewhere there are also: Mambo blvd, Pietermaai district, Sopranos Sports Bar, Carnival Casino, Kandela Cigar Lounge, Saint Tropez Ocean Club, Blues Bar at Avila Beach, Cabana Beach and much more. In the first week of January is the traditional “Fuikdag” or Fuik day. Fuik is a bay near the Spanish water, which can only be reached by boat. On this day a music festival on water takes place with well-known dj’s in the Fuik bay. Every one can participate as long as you have a boat to get there. People meet each other to share food, drinks and dance on their boats to the sounds of the various dj’s. A trip to Klein Curacao stands for little Curacao, an island North East to Curacao is more than worth your visit. Here one can snorkel and spot sea turtles. The boat trip to Klein Curacao on itself is special! In your boat dolphins, flamingos and flying fishes will accompany you to Klein Curacao. You get to see the coast and experience the sea and wind. The trip is fully catered with BBQ, fruits, drinks and snorkel gears. Beers, wines and strong drinks are –sometimes- not included in the price but can be bought there. You may want to bring your own fins or scuba gears, they will provide certified scuba instructors to accompany you, ask before you book. Trips are organized by the following organizations: Bounty, the Mermaid and Miss Ann. Curacao has a lot of snekbars, which is an acronym for snack bars. You can consider them as Curacao’s local fast food booths. They serve lemonade, beers, quick bytes such as loempia (egg roll), arepita’s (cake made of corn), johny cakes, aroz moro (spicy rice and beans) and also full dishes. You eat mostly near the booth sitting on the plastic chairs under a tree or shade. Along the road to Villa Sea Paradise that is to say, the Caracasbaai road, you will see many snekbars. Most of the time they provide music and people start to dance in a spontaneously atmosphere. Tourist’s love this island because it is friendly, has lots of scuba dive spots. It serves delicious food and has plenty of activities in a nice climate. Every year beginning of September there is this famous Curacao North Sea Jazz Festival. Here famous singers and songwriters from all over the world come to perform. Artists such as Lionel Richie, Pharrell Williams, Juan Luis Guerra and Mark Anthony and others have been there. Fans loved it. The festival is for 3 days. People from all over come to Curacao for this special occasion and event. They seize the opportunity to combine visiting this lovely Dutch island with the unique chance to see, hear and perhaps meet & greet in person world renown performers. Curacao is ideally to escape winter. It has a gorgeous sunny climate of 25 degree Celsius, which is 77 degree Fahrenheit. It has a good flight connection with USA, Canada and Europe. The locals speak English, Dutch and Spanish in addition to their native language Papiamentu. And last but not least it has a good health facility and a modern hospital. The Dutch colonial architecture, the Dutch Fortresses, give you a special Dutch touch to this island in the Caribbean. The harbor of Willemstad with a narrow entrance was the main reason why the Dutch selected Curacao as a safe haven in 1634 AD. 200 years later the Queen Emma floating bridge was built. It connected the two parts of Willemstad and made it possible for pedestrians to walk and even cars to drive from “Punda” to “Otrabanda”. Since then no longer people have to pay a boatmen to row them over from side to side or drive all around Schottegat. It was a gift from the US Embassy to the island, which still attracts tourists. We have at the Punda side, the well-known Handelskade consisting of Old Dutch warehouses adjacent to each other along the shore of Willemstad. They provide with their façade the historical Dutch architectural sight to Willemstad. Riffort in Otrabanda is one of the two fortresses at the narrow entrance of St. Anna bay. The area now functions as a shopping village. The other fortress at the other side of St. Anna bay is: Fortress Amsterdam which is now a hotel. Adjacent to the fortress you will find the Governor’s Palace. Looking further inside the harbor you will see the Queen Juliana Bridge, majestically connecting the two sides but on a higher level. This bridge plays an important role allowing cars to quickly get from one side to the other. Since then cars were not allowed any longer over the floating bridge. As the third line of defense near the Queen Juliana Bridge the Dutch built another fortress: Fort Nassau. It now serves as a nice restaurant having the most amazing views on the island, overlooking the whole harbor and the capital. Other places to visit in the town are: the synagogue, slave museum and the floating market. The synagogue is one of the oldest still functioning of the western hemisphere. It reminds people of the tolerance of the Dutch people allowing Jews to profess their believes in the colonies. This was after the inquisition that took place in Spain around 1500 AD. The Jews had to flee first to Amsterdam and later to Dutch colonies. The slave museum in Otrabanda called Kura Hulanda gives one a very good impression of the slave trade on Curacao and surrounding areas. The floating market: these are sailboats crossing from mainland Venezuela to sell fresh vegetables, fruits and fresh fishes. The sails are used as shades and all the fruits, sails and boats make it a colorful scene to look at. If you are in that neighborhood ask for the Old Market place called: Marche Bieu. Here they serve traditional Curacao food. In this restaurant they cook in front of you and everybody sit together at the different tables. Check the menu or ask for funchi with fish (Red snapper, Dorado) or funchi with stoba (Stew beef). Funchi is cooked corn meal, our traditional corn cake which replaces rice or potato. If you prefer rice try aroz moro (rice with kidney beans) instead of funchi. Flamingo breeding ground and many beaches and beautiful diving spots. If you want to see how the roaring sea and breakers waves help creating natural bridges, caves and sea water geysers then you must visit Shete Boca park with the cave of Boca Tabla and Boca Pistol. As a pistol it shoots sea water high up in the sky, like a geyser. There are several airline companies that call at Curacao Hato Airport: KLM, TUI, Air Canada, Copa, American Airlines, Air Berlin, Jet Blue Airways, West Jet, Sun Wings Airlines, Arke Fly and Surinam Airways. Come visit us and enjoy a wonderful vacation on Curacao, one of the most beautiful islands of the Caribbean. You will not regret it a bit. We love our USA, European and Canadian guests.